The growth and unsustainability of domestic debt of many countries has raised concern about the impact of domestic debt on private sector investments, economic growth and government's ability to provide basic infrastructures for their citizens, hence necessitate the need for debt sustainability across the globe. Domestic borrowings can be healthy but excessive borrowing has some distortionary effects in the economy. If government becomes heavily indebted domestically and inflation and interest rate rises, government will have to pay high to service this domestic debt. In most cases, domestic debts cannot be defaulted or reschedule unlike external debt. This is because domestic debt is mostly held by the banking sector and default may trigger a banking crisis. However, in Nigeria, the increase in domestic debt has raised many questions about fiscal sustainability of current economic policies. The fears about sustainability have also been intensified by a very short maturity period of most of the government domestic debts, and the fact that the banking sector remains the dominant holder of Federal Government domestic debt instruments, which may have negative implications for the private sector in Nigeria. For instance, the domestic debt outstanding increased from N1.091 billion in 1970 to N8.215 billion in 1980. This further rose to N84.093 billion, N898.254 billion and N4, 551.820 billion in 1990, 2000 and 2010, respectively, then peaked at N 8.873 trillion in 2015. Also, the domestic debt to GDP ratio during the same period showed the domestic debt burden on production was 6.7 percent in 1970 and 16.6 percent in 1980, rose to 17.8 percent in 1990. But was 13.4, 8.3 and 9.3 percent in 2000, 2010 and 2015, respectively. Given the above overview of domestic debt, the rising domestic debt stock shows an increasing burden on production. The increase in domestic debt service which is exacerbated by huge accumulation of stock of debt will ultimately result in an increased budget deficit. To finance this deficit, the Government has to borrow from external or internal sources. But, in a situation when the domestic borrowing is excessive, it could crowd out investment in the private sector . Hence, there is a competition between government and private sector for private savings which will drive up interest rate due to the demand for limited financial resources as well as increase the cost of borrowing leading to a reduction of credits to the private sector, which eventually stall investments in the economy. Most developing countries, including Nigeria, are characterized by high domestic indebtedness, due to the problem of domestic capital formation as a consequence of continuous drive of low yield, low income and low savings. Nigeria’s domestic debt has been on a continuous increase in recent years, fuelled primarily by escalating fiscal spending. The rising proportion of debt (both external and internal) and its increasing cost of servicing it has generated concern about fiscal sustainability of current economic policy. The major problem is not just the growing stock of domestic debt, but the over reliance on debts from the banking sector by the Federal Government in order to finance its large and unsustainable fiscal deficits. Such borrowings from the banks could amount to the injection of high-powered money into the system, which increases inflation and the cost of borrowing by the private sector [2-5]. The gravity of the problem of Nigerian domestic debt could be gleaned from the decline in government revenues, which was met by borrowing from the financial market through various instruments such as treasury bill, treasury certificate, treasury bond, federal government stock and bond. High and increasing level of domestic debt that is not sustained may have a negative effect on the ability of the government to make available basic amenities for the populace, crowding out private sector from the credit market, thereby stalling investment and output growth. Historically, foreign debt sustainability has been the center of focus with less attention on domestic debt in Nigeria. This could be due to the stringent policies attached to foreign borrowing by international creditors. Several empirical studies show that bank credits to the private sector are an important factor in economic growth. However, the literature review shows that scanty studies have been undertaken in the area of public domestic debt sustainability and the implications on the credits to the private sector in Nigeria. A close evaluation of different studies on domestic debt in Nigeria reveals that majority assessed the relationship between domestic debt and economic growth, others examined fiscal deficit and its implication on private investment. However, there is sparse study that examines the effects of domestic debt on credits to the private sector in Nigeria. Thus, this study is aimed at filling the gap in this area. In Nigeria, domestic debt are mostly held by the banking sector, hence the disruption of the government securities market could generate financial instability, and on the other hand, its sustainability would ensure stability in the financial market. Hence, the objectives of this study are to assess the sustainability of domestic debt as well as examine the impact of domestic debt on private sector credits in Nigeria [5,6]. In order to achieve these objectives, this paper is structured into 5 sections namely, the introduction, the review of related literature which shows some stylized facts of the study, the methodology, estimation and discussion of result and lastly, conclusion and policy recommendation. In the classical view, the private sector is starved of financial resources because public borrowing authority accumulates resources . This phenomenon is popularly termed private investment is crowded out. The literature on crowding out in the context of developed countries focuses on the effects of public debt on the equilibrium interest rate. This hypothesis gives clear results during the period of banking sector liberalization and the equilibrium determination of interest rate. The neoclassical economists argue that budget deficits increase current consumption, which causes a decrease in savings . The interest rate must rise to bring equilibrium to capital markets. The resulting high interest rate then results in a decline in private investment; hence budget deficit induced domestic borrowing which crowd-out private investments. Crowding in effect occurs when the government increases private sector investment through the undertaking of capital projects such as road infrastructure, hydro-power, education or health care facilities which ultimately reduces the marginal cost of producing one unit of output for the private sector. This entails that the large public spending directed towards the production of capital goods can potentially increase the stock of public capital investments and thus crowd in private sector participation [9-11]. The Keynesians provide an argument to the crowding-out effect by making a reference to the expansionary effects of budget deficits. They argue that usually budget deficits result in a rise in domestic production, which makes private investors to become more optimistic about the future course of the economy and invest more. This is called the “the crowding-in” effect. Looking at some empirical works in the literature, Oluitan assessing the significance of real bank credit in stimulating real output growth in the case of Nigeria using a time series data from 1970 to 2005 observed that credit granger causes output. The study also recommended financial system intermediation as a way of enhancing credits. However, this study is not without some short comings as it lacks more empirical evidence in looking at the impact of bank credit stimulation of economic growth and also failed to look out how domestic debt contributes in credit reduction. Anyanwu et al. looking at government domestic debt, private sector credit and crowding out effect in oil-dependent countries using a panel data model for 28 oil-dependent countries in which Nigeria was inclusive from 1990-2012 found out that 1 percent increase in government borrowings decreases private sector credit by 0.22 percent although not significantly which is indicative of a shrink in private credit as a result of government domestic borrowings. The study failed to make some policy recommendations on how the crowding out effect can be handled. Also, Iwedi et al. examined the impact of banks domestic credits on economic growth in Nigeria using a time series data from 1980-2013 employing the Ordinary Least Squares (OLS) method of estimation. The study found out that the credit to both the private sector and the government were positively and significantly correlated to the GDP in the short run while it had a poor relationship in the long run and recommends a proper utilization of borrowed funds in achieving the objective of the investment. However, this study is not without some flaws as there was autocorrelation in the model which was not corrected and there could also be a case of omitted variable bias as some key growth variables such as labour was missing . On the other hand, Onogbosele and Ben looking at the impact of domestic debt on economic growth in Nigeria from 1985 to 2014 employing the Augmented Dickey fuller test for unit root and the Vector Autoregression method of analysis revealed that domestic debt played an important role in the growth process of the Nigerian economy. Using the findings of the impulse response function it also revealed that economic growth responded positively to the shocks in the Federal government of Nigeria bonds and negatively to shocks in treasury bills throughout the ten year period and recommends that the government should acquire funds using the former. However this study failed to account for the impact the domestic debt would have on the credit to the private sector . Also Nwamaka et al. examined the empirical relationship between domestic debt and the performance of Nigerian economy using a time series data from 1987 to 2014 using the OLS method of estimation showed a positive significant relationship between domestic debt and GDP in Nigeria and recommends that the government diversify some of its projects to the private sector as well as create an enabling environment for the private sector investors to thrive in as mentioned in Table 1. This study is not void of some flaws as the number of years used in the study is below 30 years and the method of estimation is not adequate as some violations of OLS were not tested for and it failed to mention the crowding out effect this domestic debt could bring. Source: Author’s computation from Eview 9.0. From the reviewed literature, it is obvious that there is a gap on works relating to the impact of domestic debt on private sector credits and some limitations has also been found in the method of estimation used hence this study tends to fill in these identified gaps. The baseline scenario is 40 percent of the domestic debt ratio to GDP to be sustainable. From Table 2, it was shown that Nigeria Domestic debt/GDP was less than the baseline 40 percent in each of the years with average of 14.5 which that it is sustainable from 1970 to 2015. Table 2. Summary of results of stationary tests. Source: Author’s Computation from Eviews (2016). The domestic debt/revenue was sustainable at the baseline scenarios of 200 percent from 1970 to 2015. But, it was unsustainable in 1983, 1984, 1986, and 1994 (see Table 2). The early 1980’s were period that the country’s revenue earning from the sale of crude experienced a drastic decline which could explain the unsustainable nature of domestic debt during the period. However, Nigeria is liquid enough to repay her domestic debt without difficulty in most of the periods from 1970 to 2015. The domestic debt service/GDP with the baseline scenario of 3- 3.6 percent was unsustainable from 1970 to 2015 (see Table 2). This suggests that domestic debt service could depress domestic productivity. Domestic debt service/expenditure with baseline scenarios of 7.5-9.0% was sustainable from 1970 to 2015 but unsustainable in 1986, 1987, 2013 and 2015 (see Table 2). Domestic debt services could have overriding effect on the country’s expenditure basket. The domestic debt service/GDP with the baseline scenario of 20–25% was sustainable from 1970 to 1985. It rose up from 1986 to 1994. Since 1995, it has maintained a sustainable level with 7.15 percent in 2015 (see Table 2). In 1970, commercial held 46% of the domestic debt instruments, while the non-bank public and Central Bank of Nigeria (CBN) held 45 and 9%, respectively in Nigeria. However, between 1971 and 1980, non- banking public grew to be the dominant holder of government securities as its share rose to average of 54%, CBN grew to average of 10%, Commercial and Merchant bank 35 and 1% , respectively. Moreover, CBN was the dominant holder in 1981 to 1990 and 1991 to 2000 but the commercial bank took over as the dominant holder in 2001 to 2015 (see Table 1). The banking system (CBN, commercial and merchant banks) held majority of the domestic debt in Nigeria from 1981 to 2014 but fell below 50% in 2015 while the non-banking sector became a significant holder in 2015 (see Table 1). This suggests that the federal government of Nigeria predominantly incurs domestic debts from the banking system. The literature suggested that government usually finance fiscal deficits with debt from internal sources, if internal banking and financial sectors are developed with high savings . The depth of the financial sector determines the length of domestic market expansion, which is indicated in the literature as the ratio of broad money (M2) to Gross Domestic Product. In Figure 1, the ratio of broad money to GDP of Nigeria indicates that the financial sector of Nigeria was not deep from 1970 to 2015, with the broad money as a percent of GDP was less than 30 percent in but 32 percent in 2008. The ratio of domestic debt to broad money was more than 100 percent from 1971 to 2000 but fell continuously from 80 percent in 2001 to 46.8 percent in 2015. Though the high financial depth of the banking sector might have encouraged the Federal Government to borrow from the sector (see Figure 1). 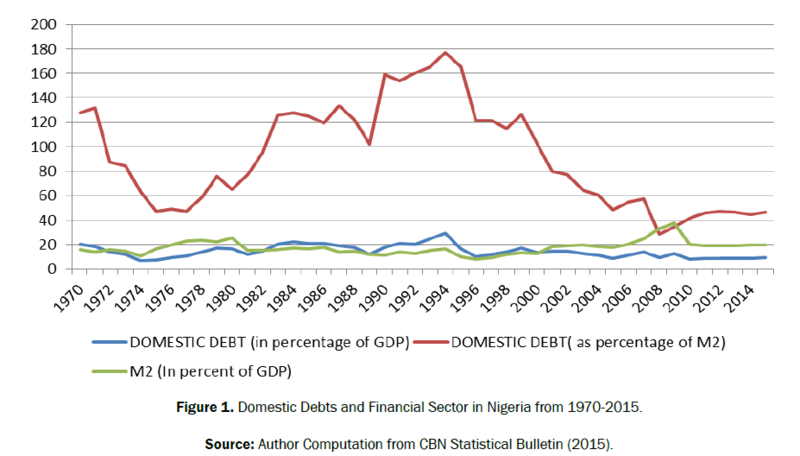 Figure 1: Domestic Debts and Financial Sector in Nigeria from 1970-2015. In Nigeria, like most developing countries, with the rigid structure of the economy and low level of income usually experience difficulties regarding raising revenue because the set of policy instruments available are limited. Facing such constraints the government has the option of borrowing from the internal or international credit market . But the access to international credit market is limited, hence, the government in resort to borrowing more from internal sources. Figure 2 plots the time series data of credits to private sectors and net claims on Federal Government of Nigeria (FGN) in Nigeria from 1970 to 2015. 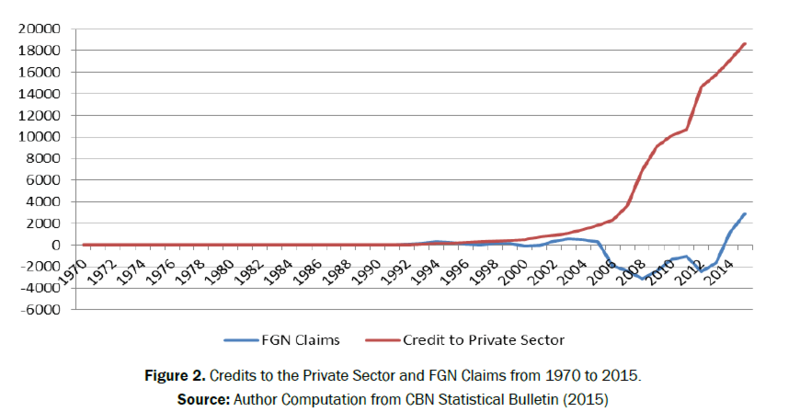 Figure 2: Credits to the Private Sector and FGN Claims from 1970 to 2015. The figure shows Federal Government borrowings (FGN) and private credits in Nigeria are positively correlated from 1970 to 2004. This could be an indicator of the presence of crowding in of private credits. From 2005 to 2015, the private credits moved upwards, far above government borrowings, which could be as a result of growth in foreign investment flow into the banking sector driven by the bank re-capitalisation policy of CBN. Further assessment of this behavioral relationship can be carried out using econometric models. This study employ secondary annual time series data sourced from CBN Statistical Bulletin (2015). The VAR approach is employed in examining the response of private sector credit to shocks from domestic debt. Sims, Bernanke, Shapiro and Watson put forward econometric models known as structural vector auto-regression (SVAR) or identified VAR. The Structural Vector Auto regression (VAR) adopts econometric theory rather than the cholesky decomposition to recover structural innovations from residual of a reduced form VAR. A bivariate VAR model in which each variable has concurrent effect on the other is being considered. This approach provides a basis for characterizing the relationship between the policy variables and the non-policy. In an attempt to assess the relationship between government domestic borrowing and private credits, the study focuses on two key variables. The first is the crowding out effect proxy by the ratio of domestic debts to credits to private sector. The second is the cost of borrowing the from the banking sector, which is proxy the maximum lending rate. The study adopts the model from the study by Maana et al. CPSGDP=the percentage of credits to Private Sector to GDP. DDGDP=the percentage of Domestic Debt to GDP. β0 is the intercept while β1, β2, β3 are the parameters. Data analysis and interpretation of findings from the model put forward as well as testing of the research hypothesis. The parameter estimates were subject to econometrics test employing Augmented Dickey-Fuller, Phillips-Perron, Ng-Perron (NP) test and the Kwiatkowski, Phillips, Schmidt and Shin’s (KPSS) test of unit root, Johansen Cointegration test and the Structural Vector Auto-Regressive (SVAR) approach. The correlation matrix helps to identify the level of correlation that exists among the explanatory variables. 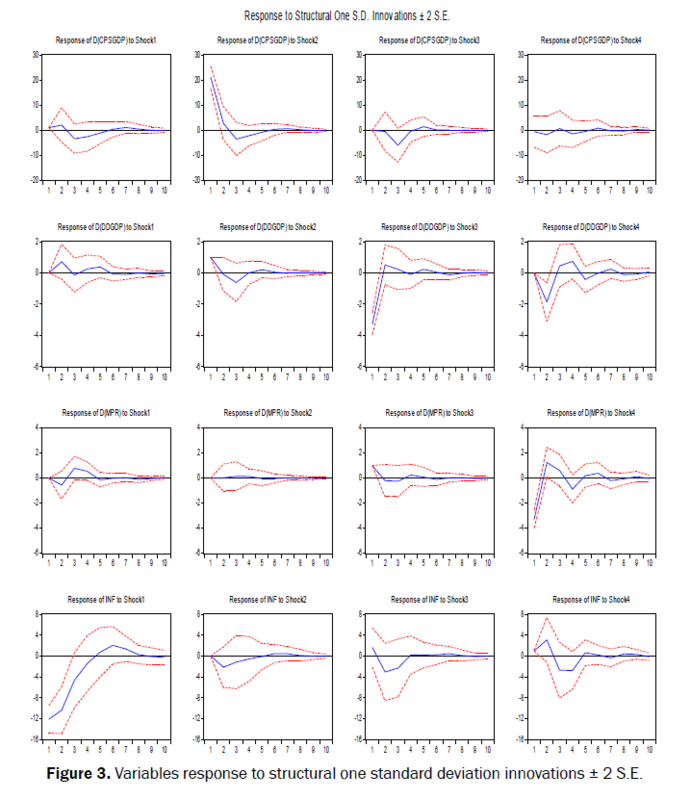 From Table 1, it can be observe that there is absent of strong correlation among the explanatory variables, which suggests the absence of multicollearity in the model . The motivation behind the assortment of tests is to obtain reliable and consistent results. Therefore, this study employed Augmented Dickey-Fuller, Phillips-Perron, Ng-Perron (NP) test and the Kwiatkowski, Phillips, Schmidt and Shin"s (KPSS) test designed to overcome the problems of low power and size distortions inherent in the traditional tests. Depending on the order of integration of the variables, the variables were feed into the SVAR model at their levels or first-differences. All the variables (CPSGDP, DDGDP and MPR) possess unit roots and became stationary only after they were first differences except inflation rate (INF) (see Table 3). Note “*” Indicate the co-integrating equation. Source: Author’s Computation from Eviews 9.0. Both the trace statistics and the Max-Eigen Statistics indicated the present of one co-integrating equations at 5% level of significance. Thus, the result confirms the present of co- integration between CPSGDP, DDGDP, MPR and INF at 5% significant level (see Table 3). Hence, these variable exhibits long-run association. The FPE, LR, AIC and HQ criteria suggested that the lag strength should be two while SC suggested the use of one as the lag strength (see Table 4). This study employed lag two as the lag strength since four out of the five lag criteria select it. Table 4. Lag order criteria. The SVAR employed in this study is based primarily on the crowding out Hypothesis which implies that excessive domestic debt by the government reduces the window of opportunities for private sector to access credits for investment. To determine the role of DDGDP changes in causing movements in CPSGDP, estimate the effect of endogenous shock to the CPSGDP, ecpsgdp by estimating equation (8). But equation (8) is not identified in the as long as θ1−5 (shocks to be estimated), γ1−3 are not each equation to zero, the observed innovation in the variable cpsgdpt will depend on both the shock to the DDGDP and on the shocks of other variables in the system. The value of zero means that the innovation exhibit no effect on the other variable, thus, the variable continues on the same path it would have followed had there been no innovation. A positive or negative value indicates that the shock would cause the variable to be above or below its “natural" path as the case may be. The solid lines depict the estimated effects, while the dashed lines show the boundaries of a 95% confidence interval. Meanwhile the main concern of this paper is to examine the implications of credit to private sector shocks to a combined response (behaviour) of other variables, we concentrate graph on the first row of Figure 3. Figure 3: Variables response to structural one standard deviation innovations ± 2 S.E. Panel B1 of Figure 3 shows the response of credits to private sector to expansionary shock in domestic debt measured by DDGDP (shock 2). Here, credits to private sector falls quickly and significantly within the first two years due to expansionary shocks from domestic debt. After which, the shocks become significantly more chocking on credits to private sector till the fifth year. The responses are consistent with the theoretical expectation and confirm the thin nature of the credit market in Nigeria. This findings suggest that expansionary domestic debt induce a prolong crowding out effect on credits to private sector in Nigeria similar to the scenario in most developing countries.Panel C1 of Figure 3 shows the response of credits to private sector to expansionary shock in monetary policy rate measured by MPR (shock 3). Again, the response of credits to private to expansionary monetary policy rate shock was negative and significant from period 1 to period 5, with credit to private sector returning to its natural path afterwards. This response is consistent with our a priori expectation based on the Neo-classical position on the effect of budget deficit on interest rate through consumption and savings equalization channel. This suggests that expansionary monetary policy discourage credits to private sector since the former is the anchor interest rate in the economy. Panel D1 of Figure 3 shows the response of credits to private sector to shock in inflation rate measured by consumer price index (shock 4). The response of credits to private sector to shocks from inflationary pressure was positive, significant and unstable. This paper evaluates the long run impact of Nigeria’s domestic debt on private credit. The result obtained reveals that domestic debt have a negative impact on private credit as a result of Federal Government’s excess borrowings from the banking sector to finance huge fiscal deficit thus, crowding out private investors. The econometric analysis results also show that monetary policy and inflation rate exhibit adverse impact on credits market. Therefore, the government through its relevant authorities should design a favourable monetary policy framework to ensure a substantial development of the private sector. This study concludes that the private organizations, policy makers, and government should make a unification of interest in order to achieve the goal of domestic debt sustainability and ensure stability in the financial market which is the backbone of any developing nation. The Federal government of Nigeria through The Debt Management Office should reschedule the domestic debt from shorter term to longer-term maturity instrument with appropriate interest rates as well as ensure proper utilization of the funds. A longer maturity structure implies a smaller proportion of the debt refinanced at any given time while funding operations and maintaining existing capital investment in the areas of public infrastructure, the government should formulate cost-effective expenditure policies in the management of public expenditure mix in order to minimize financial wastes as well as privatization of public utilities that are large drains on government revenue. The Federal government of Nigeria through The Debt Management Office should sustain the restructuring of the domestic debt away from the banking sector as the dominant holder. The Central Bank of Nigeria should employ a more stable monetary policy. Ahmed MF and Rahman MM. Water Supply and Sanitation-Rural and Low Income Urban Communities, ITN-Bangladesh, Center for Water Supply and Waste Management. BUET, Dhaka, Bangladesh 2000. Azad AK. Impacts of Farakka Barrage on surface water resources in Bangladesh. World Environment Day. The Report of Department of Environment, Government of Bangladesh 2003;40-43. Ali MA. Public private priority for water resource management in Bangladesh water. Two billion people are dying for it. Department of Environment, The Government of Bangladesh 2002.
WHO. UnWater Global Annual Assessment of Sanitation and Drinking water: Targeting resources for better results. WHO, Geneva 2010. Elizabeth MJ. Water Aid. An Overview of the Arsenic Issue in Bangladesh Dhaka 2000. Bangladesh Bureau of Statistics. Statistical Yearbook of Bangladesh-2013. Ministry of Planning Government of The People's Republic of Bangladesh, Dhaka 2013. Rani N, et al. Assessment of temporal variations in water quality of some important rivers in middle Gangetic plains, India. Environmental Monitoring Assessment 2011;174:401-415. Rahman MS, et al. Assessment of treated wastewater comes from decentralized wastewater treatment system at Rakibnagor slum, Tangail, Bangladesh. Bangladesh Journal of Environmental Science 2014;27:106-109. Jesmin MS. Pollution studies on groundwater for irrigation, drinking and industrial usage in Gaibandha aquifers. Bangladesh Agricultural University, Mymensingh 2000. Halim MA. Seasonal variation of pond water quality in selected fish farms of Mymensingh area. Bangladesh Agricultural University, Mymensingh 2009. Alam MS. Assessment of surface water quality for agricultural usage in Chalan Beel area. Bangladesh Agricultural University, Mymensingh 2008. Sen R, et al. Ground water and surface water quality for irrigation in some selected sites of Tongi in Gazipur district. Bangladesh Journal of Agricultural Research 2000;25:593-601. Begum K. Assessment of heavy metal contamination in some soil and waters of Bogra city, Bangladesh. Bangladesh Agricultural University, Mymensingh. 2011. Nizam MU, et al. Copper, manganese, iron, zinc and arsenic toxicity detection in water sources of Madhupur Tract. Bangladesh Agricultural University, Mymensingh 2000. Inveraity RJ, et al. The effect of Impoundment on the Downstream Macro invertebrate Riffle Fauna of the River Elan. Midways Environmental Pollution 1983;32:245-267. Zaman AS, et al. A random study of the microbiological quality of bottled drinking water in Bangladesh. Proceeding of the 110th American Society for Microbiology (ASM) Conference 2010.